The 1889 tug Arthur Foss, ex-Wallowa, a National Historic Landmark, is a preserved historic vessel, part of a fleet of historic ships owned and maintained by Northwest Seaport, Inc. of Seattle, Washington. Arthur Foss is an excellent example of late 19th century American wooden tugboat. 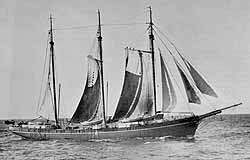 Built in 1889 in Portland, Oregon for a seemingly local use the 111-foot Wallowa was associated with trading and events of significance to the nation. It began service towing ships and barges carrying Oregon grain and lumber over the treacherous Columbia River Bar. With the discovery of gold in Canada along the Klondike in 1896, Wallowa moved north, towing ships carrying miners and supply barges to Alaska, playing an important role in the transportation of people and goods to Alaska during the Klondike gold rush. In 1904, Wallowa moved to the Puget Sound, towing log rafts around the Sound and along the Washington coast. In 1929, the Wallowa was sold to the Seattle-based Foss Launch and Tug Company who leased her to MGM Pictures to star as the tug Narcissus in the movie “Tugboat Annie”(1933) a film that epitomized tugboats and tugboating for a generation of Americans. The Wallowa was rebuilt with a new 700 h.p. diesel engine and became the powerful coastal tug Arthur Foss. She set speed records up and down the Pacific Coast before being leased to the U.S, Navy and sent to the Hawaiian Islands just prior to World War II. In December 1941, she became the last vessel to escape Wake Island before the Japanese captured the atoll. Arthur Foss spent the war years in U.S. Navy service. Following the war, the Arthur Foss returned to Puget Sound and Foss put her back to work towing logs. Based out of Port Angeles, she towed logs rafts until being laid up in 1968, a hard worker until the end. Foss decommissioned her and in 1970 donated her to Save Our Ships organization (which later became Northwest Seaport). In 1989, the Arthur Foss was designated a National Historic Landmark. 123 years of operation resulted in minor changes but, beside the engines, no major modifications to Arthur Foss. All repairs and replacements to the hull and superstructure followed original lines and used in-kind materials, retaining the vessel's pre-Second World War "typical" tugboat appearance. Serving on Puget Sound for the regionally-significant Foss Launch and Tug Co. for much of her 20th century career, Arthur Foss, while of national significance, also is indelibly linked to the important maritime traditions of the Pacific Northwest. The Arthur Foss, a National Historic Landmark, is located at the Historic Ships Wharf at Lake Union Park, just north of downtown Seattle, and is open to the public seasonally and for education programs, special events and vessel stewardship activities. For information about Northwest Seaport, please call (206) 447-9800 or visit http://nwseaport.org.